I am just making a note for myself here and anyone else who might encounter this error. 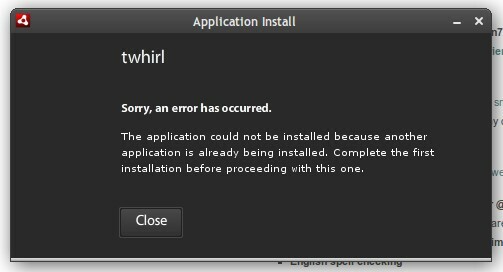 I was trying to install TweetDeck in LinuxMint Gloria – a Ubuntu Jaunty 9.0.4 variant. It just so happened that I had Synaptics Package Manager open installing other software and Adobe AIR installer doesn’t like it. As soon as I closed it, it worked like a charm.